We contracted with KPMG to conduct this performance review of the Department of Watershed Management. The City Council passed resolution 08-R-1014 May 19, 2008, requesting the audit in conjunction with considering the department’s proposed water and sewer rate increases. 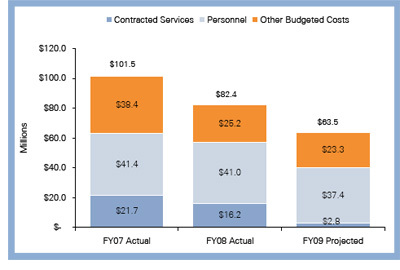 Analysis of assumptions underlying Watershed’s rate model suggests that the four-year plan the department proposed in April 2008 would likely generate revenue beyond what the department needs to fund operations, meet bond requirements, and meet its consent decree obligations. Several aspects of the department’s $4.1 billion capital program, notably construction management, generally appear to be effective. With its $7.2 million enQuesta implementation and $35 million meter replacement project nearing completion, Watershed continues to rely on estimated water use for billing. The department’s water loss, last estimated in 2007, is high. 2008, to $81.0 million as of November 30, 2008.